NM062SBMC - EXEDY Racing Hyper Carbon Series - Dezod Motorsports Inc - Home of the automotive performance enthusiast since 2002. The flagship model of EXEDY clutches, the Hyper Carbon Series. In 1995 EXEDY supplied carbon clutch products for use in the pinnacle series of motorsport; Formula One. This same technology is now applied to carbon clutches developed by EXEDY for use on the street and track. These clutches are lightweight, durable and resilient to high heat, contributing to an improvement in track times. Available in single, twin and triple designs with both rigid or damper discs for a full range of power holding capacity. EXEDY carbon discs are able to perform through long durations of high rotational velocity due to our precise application of carbon. The fibers are set one-by-one in a weaving pattern and baked at more than 3600°F, finalizing the strengthening process. Heat expansion rate is 1/20th of iron therefore eliminating a change in clutch feel that may happen due to distortion caused by expansion during driving. Carbon material also possesses a “non-stick” characteristic that eliminates disengagement problems. 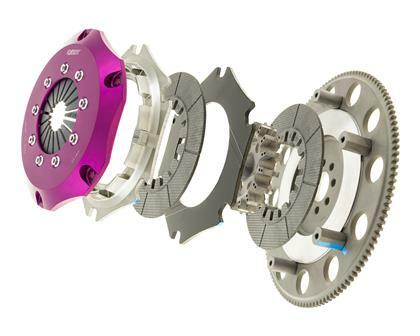 The next generation of clutch systems by EXEDY is the Hyper Carbon-D, the revolutionary carbon clutch system. Carbon-D was developed to achieve the ultimate goal of comfort and streetability by absorbing noise and vibration emitted from drivetrain components such as the differential, transmission and engine. The Carbon-D system is designed to protect the drivetrain by absorbing and dissipating “shock torque” by utilizing EXEDY Patented Technology. 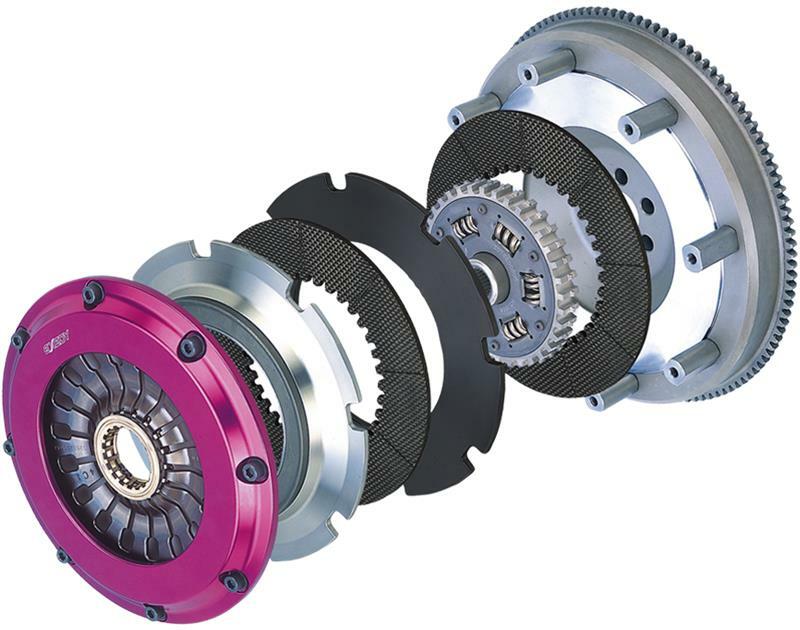 Superior engineering enables the Carbon-D clutch system to posses an ideal clutch engagement position, increased clamp loads and lower pedal effort, while the unique carbon fiber friction material allows comfortable half-engaged clutch operation and responsive gear changes. The EXEDY Hyper Carbon-D is available in both single and twin clutch configurations. The weight of a carbon clutch disc is one third that of a metallic disc. Utilizing a high friction coefficient Hyper Carbon disc which allows for quicker shift response. Low inertia discs allow the transmission to synchronize in a shorter space of time eliminating time loss during shift changing while also reducing the applied load to the synchronizer. By controlling the carbon fibers and baking temperature, the cross layer type carbon material, which is the most appropriate for high revolution strength and high torque transmission, is applied to tuning car clutches. 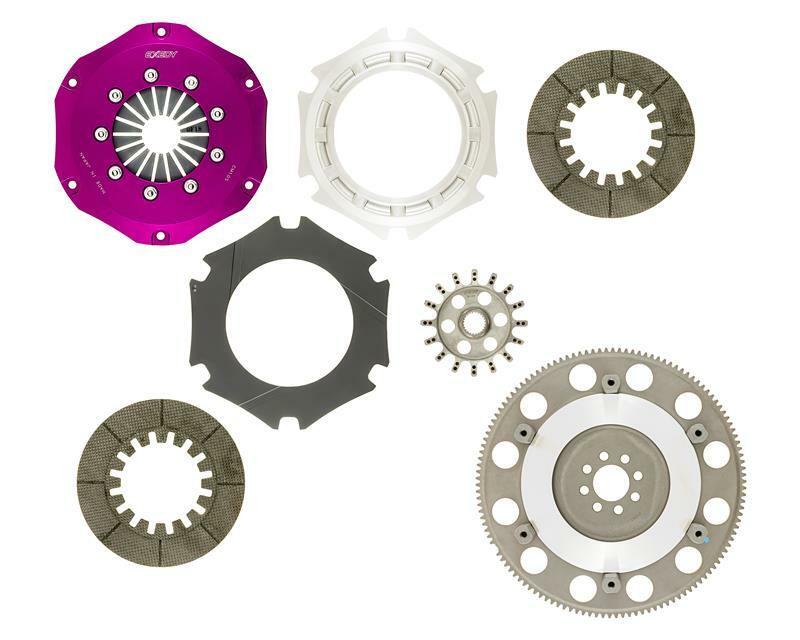 Semi-carbon clutches offer lightweight, high heat resistance and a stable friction coefficient. EXEDY carbon clutches are tuned so that at a lower temperature, engagement feeling is improved and conversely at high temperatures, engagement is ideal for spirited driving. All EXEDY Racing Hyper Carbon Series Clutch Kits carry SFI 1.2/1.5 Certification. Which means, when you buy these products, you can be confident they are certified for use in competitive motorsports.